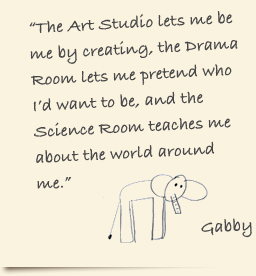 A combination of linguistics, art, science, computer, drama and fine motor, Studio 5 has the greatest variety of learning journeys to offer to students. Facilitated by the team of two teachers that spread their support evenly throughout the room, this creates a variety of learning opportunities available to the class each day. Often referred to as 'the Blue Room' because of the calming nature, Studio 5 hosts one class at a time, and runs a plethora of programs throughout the day.